As the world applauds the winners of this year’s Nobel Prize in Physics, three American physicists whose pioneering work in detecting and observing mysterious gravitational waves brought a 40-year project to its successful conclusion, China has stepped up its own efforts in the field. Gravitational waves were first postulated by Albert Einstein in 1916. He believed they would follow naturally from his general theory of relativity, which holds that space and time distort in the presence of mass, creating the effect we perceive as gravity. Therefore, when supermassive objects, such as two black holes, spiral toward each other, he theorized they would squeeze space-time and create vibrations that would ripple out across the cosmos, traveling at the speed of light to the farthest reaches of the universe. Because it was theorized that supermassive black holes would swallow all the light in their vicinity, the collision of two black holes was unable to be observed by conventional telescopes. Gravitational waves were thought to be the only thing capable of escaping a black hole’s crushing gravity. But almost a century after Einstein first theorized them, these gravitational waves had still not been detected. Only in the past two years did scientists at the Laser Interferometer Gravitational-Wave Observatory (LIGO) in the US finally detect signs of gravitational waves. After first detecting a wave caused by the collision of black holes in September 2015, the LIGO team announced a total of four gravitational wave signals had been detected in the period to September 2017. All were thought to have been created by pairs of colliding black holes. The latest was found on August 17, and was named GW170817. It was revealed to the world on October 16. But GW170817 was distinct from the others because it was caused by a collision between two neutron stars (thought to be the second-most massive objects in the known universe). This time LIGO had company – the wave was also detected in Italy at the Virgo interferometer near Pisa. But while the US and Europe are spearheading the work of transforming theoretical physics into observable reality, China is making its own progress. China’s first Hard X-ray Modulation Telescope (HXMT), known as Insight, was launched into orbit this year on June 15. This observatory was set up to observe black holes, neutron stars, active galactic nuclei and other phenomena by detecting X-ray and gamma ray emissions. 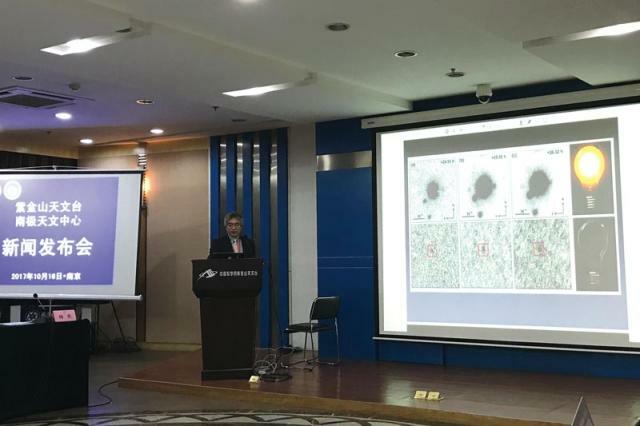 Zhang Shuangnan, lead scientist of HXMT and director of the Key Laboratory of Particle Astrophysics at the Chinese Academy of Sciences (CAS), told NewsChina that on August 17 – as LIGO and Virgo were detecting GW170817 – his team had monitored the process closely and conducted data analysis. According to a news release from CAS on October 16, “it is widely believed that this kind of new gravitational wave event can also produce strong electromagnetic (EM) emissions.” This sparked a hunt by observatories across the globe to detect light signals possibly corresponding to gravitational waves, or the EM counterpart of this event, searching at frequencies from radio to very high energy gamma rays. Xiong Shaolin, a scientist at the Institute of High Energy Physics of CAS, told the official state news agency Xinhua in May that if scientists could find EM signals that corresponded with gravitational wave events, it would increase the reliability of the detection. “Combined analysis of the gravitational wave and electromagnetic signals will help reveal more about the celestial bodies emitting the gravitational waves,” Xiong added. The gamma ray burst during the GW170817 event set off the Fermi Gamma Burst Monitor (GBM) operated by NASA, and soon after, was confirmed by analysis of data from the European INTEGRAL satellite. According to Zhang, Insight has the largest detection area and best time resolution in the 0.2-5 MeV range among the four X-ray and gamma ray telescopes (Fermi, INTEGRAL, Insight-HXMT, and Konus-Wind) that were monitoring GW170817 when it reached Earth’s view. However, Xiong told NewsChina in late October that bucking predictions, the GW170817 waves were weak and soft, making it harder to detect. “Thus, neither Insight-HXMT nor any of the other telescopes detected any significant emission in this energy range,” continued Xiong. “Despite this, HXMT has made an important contribution to gravitational wave astronomy by setting a strict upper limit on its electromagnetic radiation flux in the 0.2-5 MeV range.” This is an important contribution for the study of gravitational waves caused by neutron stars merging. Xiong also told NewsChina that the observational results of HXMT will be published in both domestic and international science journals. As another follow-up detection of the gravitational wave event, China’s South Pole telescope AST3-2 set up in China’s Antarctic Kunlun Station also had significant success. “A neutron star collision is the massive gold production process for the whole universe, and by studying gravitational waves, we can learn about the creation of heavy metals such as gold and silver from the ‘magnificent bursting fireworks’ in the cosmos,” associate researcher Jin Zhiping from Purple Mountain Observatory under CAS, also in Nanjing, told Xinhua. Jin has joined a group of international scientists, and by observing the light signal and gravitational waves via spectral analysis, they discovered that the merging of neutron stars is indeed the very source of those heavy metals in the universe. 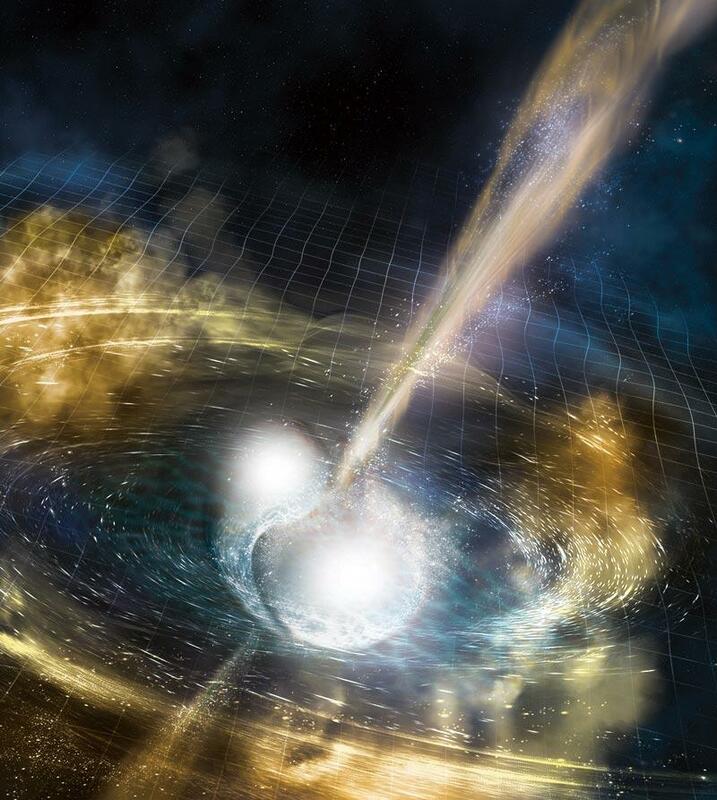 Some Chinese scientists, including Wu Xuefeng and Jin Zhiping, both of Purple Mountain Observatory, have predicted the next unprecedented gravitational wave event would be a collision between a neutron star and a black hole. With the progress of current technology, it is highly likely that this will be able to be detected within the next couple of years. According to Wu and Jin, low frequency gravitational waves generated from merging stars like white dwarves, and the primordial gravitational waves produced during the Big Bang also require further exploration. China has started a ground-based observatory project called “Ngari,” and the “Taiji” Plan and “Tianqin” Plan are ready to monitor medium and low-frequency gravitational wave signals. The Institute of High Energy Physics also plans to build a telescope specifically for detecting gamma ray bursts. The GECAM (Gravitational Wave High-energy Electromagnetic Counterpart All-sky Monitor) project, is also known as Lighting. If approved it is scheduled for orbit by 2020. Xiong says higher sensitivity and better positioning capabilities will see it make China a world leader in the study of the electromagnetic traces of these cosmic crashes. Chinese gravitational wave research began in the 1970s. CAS academic Wu Yueliang told NewsChina that when Joe Weber from the University of Maryland in the US claimed to have identified gravitational waves in the 1960s, triggering global interest, researchers at China’s Institute of High Energy Physics at CAS and at the Guangzhou-based Sun Yat-sen University began their own work. When other scientists were unable to replicate Weber’s results they were considered void, and enthusiasm faded. Chinese research in the field followed suit. Wu explained that without certainty, and given the potential high cost of the research, gravitational waves were not regarded as a particularly efficient use of science funding. CAS launched its expert team on gravitational study in 2008, but the study stayed in the preliminary exploration stage without sufficient funding. The very idea of a “Taiji” Plan was formed that year, said Wu. In 2011, CAS teamed up with the European Space Agency's eLISA project to explore the waves from the space. CAS offered to pay for one-fifth of the eLISA project in return. eLISA, or “Evolved Laser Interferometer Space Antenna,” was initiated in 1990s and is designed to detect gravitational waves using three spacecraft in a triangle formation beaming lasers between each other. It is planned to launch in 2034. According to academic Hu Wenrui, also Taiji Plan lead scientist, eLISA will be able to provide more information than LIGO's ground-based observatory. Apart from joining the eLISA project, by 2033 the Taiji Plan also aims to launch three of its own Chinese satellites, which will orbit the sun in a triangle formation to authenticate any data that the eLISA project comes up with. Wu admitted that Taiji and eLISA are competitors as well as collaborators. Meanwhile, Sun Yat-Sen University in southern China has launched a project called “Tianqin,” which aims to launch three satellites that will orbit some 100,000 kilometers above Earth. They are expected to launch in 15-20 years, around the same time as the Taiji Plan, at a total estimated cost of 15 billion yuan (US$2.26 billion). When it comes to the development of ground observatories, there are plans to set up the world’s highest-altitude gravitational wave telescopes in Ngari Prefecture in the Tibet Autonomous Region. Originally proposed in 2014 by researcher Zhang Xinmin from the Institute of High Energy Physics at CAS, construction began in January 2017. The Ngari gravitational wave observatory project is expected to cost around 130 million yuan (US$18.8 million), and it is operated by the Institute of High Energy Physics, National Astronomical Observatories, and Shanghai Institute of Microsystem and Information Technology. According to Zhang Xinmin, the Ngari observatory is expected to be operational by 2020 and will be among the world’s top primordial gravitational wave observation bases. “Considering there has been no successful detection of primordial gravitational waves so far, it’s possible we will be the first to spot one,” Zhang told NewsChina. With sufficient funding and favorable policies supporting the Ngari Plan, Zhang said he feels fortunate, but pressured. “Now, the most critical issue is to speed up,” he added.